For 26 years, the Business Writing Institute has been providing writing skills workshops for employees, professionals, leaders--anyone who writes on the job. We also offer award-winning writing and editing services for clients in every industry & profession. For 26 years, the Business Writing Institute has been providing writing skills workshops for employees, professionals, leaders--anyone who writes on the job. We also offer award-winning writing and editing services for clients in every industry & profession. Founder & President Nancy Flynn wrote the book on how to write powerful, persuasive e-mail, business documents, and electronic /employment policies. Author of books including Writing Effective E-Mail, The Social Media Handbook, The ePolicy Toolkit—and executive director of our sister company, The ePolicy Institute™—Nancy Flynn is recognized worldwide as the leading expert on writing effective & compliant email. An in-demand trainer & business writer, Nancy Flynn knows what it takes to produce well-written business documents, legally compliant e-mail, and effective policies. Contact Nancy Flynn to discuss your needs and our services. A must for anyone who writes on the job! 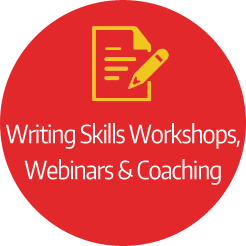 Our onsite and online courses are designed for those who seek real and immediate improvement in their business writing skills. From administrative professionals to C-level executives, you’ll return to your office armed with the skills and strategies necessary to write clear, compelling, correct, and compliant e-mail, business documents, and policies. Business Writing Institute training is an investment in your organization’s assets, reputation, and future. Don’t let sales, customer satisfaction, and career advancement slip away. Learn more about our proven-effective training programs. Learn to write e-mail that is read & acted upon, not ignored & deleted! Nancy Flynn, founder of the world-renown ePolicy Institute and author of Writing Effective E-Mail—in its third edition and published in English, German, Chinese, and Spanish—is recognized worldwide as the leading expert on effective & compliant electronic writing. This book teaches you how to write effective e-mail messages, social media posts, and other online content—without triggering a lawsuit, regulatory audit, termination, or PR nightmare. 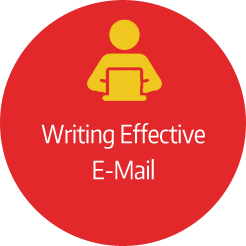 Learn how to write email without getting fired, sued, or humiliated. 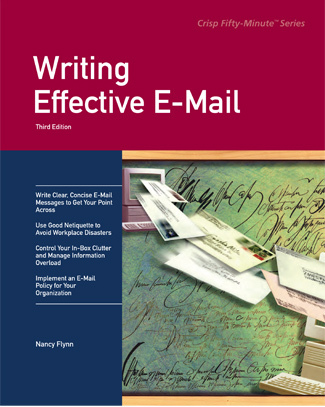 Revised in July 2014, Nancy Flynn’s Writing Effective E-Mail, 3rd Edition, has been completely updated with new content & exercises. Bonus: Sample e-mail, mobile device, and writing style policies that you can implement immediately. Whatever your writing need, we have you covered! Award-winning business writer Nancy Flynn is regularly called upon to write annual reports, brochures, whitepapers, case studies, blogs, new releases, training materials, PR materials, and other content for a client roster that includes Fortune 500 companies, healthcare organizations, government agencies, and technology leaders among others. An executive ghostwriter, Nancy Flynn has written thousands of articles under clients’ bylines for business and consumer publications. 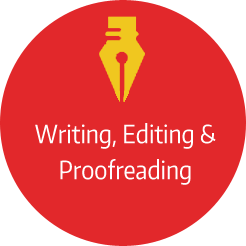 Professional editing & proofreading services available. Whatever your writing needs, we have you covered. "The grammar, capitalization, and punctuation tip sheets you provided as part of the workshop were extremely helpful. I find myself regularly pulling out those tips. As a refresher and constant reminder, your tip sheets are extremely helpful."